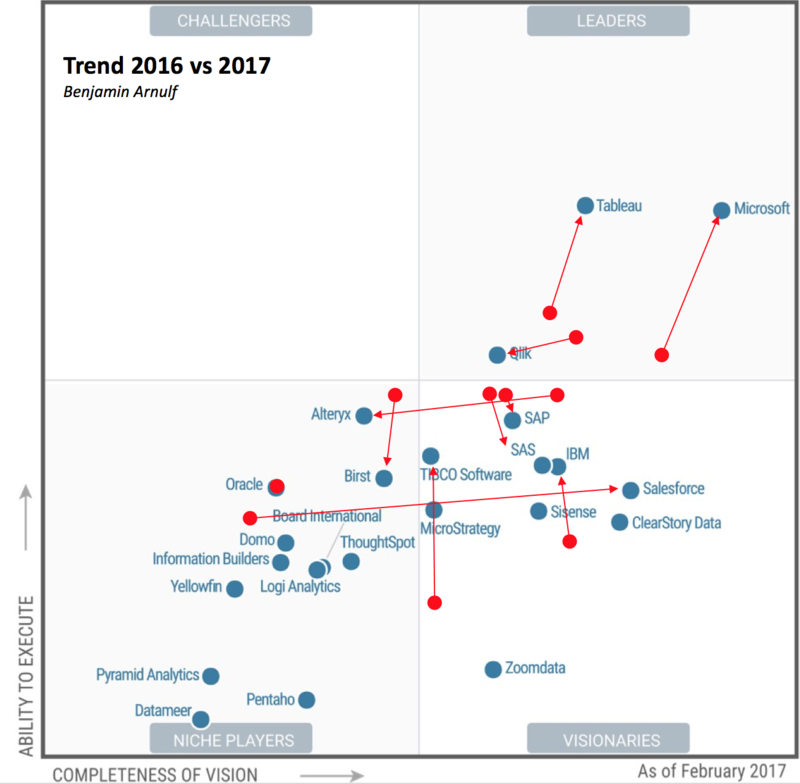 Gartner has released its 2017 Magic Quadrant and Microsoft has delivered the most improved performance in terms of ability to execute and completeness of vision, firmly establishing itself as a leader in Gartner quadrant. Gartner justifies the position stating Microsoft is “placing downward pricing pressure on the BI and analytics market.” It notes that a Power BI license is one-third the cost of a license for other tools, and 80% lower than other cloud offerings. The software also scores well in the ease-of-use and complexity of analysis categories. Gartner also lauded PowerBI’s capability to manipulate data from multiple data sources, such as Hadoop and relational databases residing in the cloud or on-prem. Gartner has predicted a rosy future for cloud BI and analytics “Gartner expects the majority of new licensing buying to be for cloud deployments by 2020, although, at present, on-premise is the dominant mode,” it said. Additionally they have predicted “By 2020, natural-language generation and artificial intelligence will be a standard feature of 90% of modern BI platforms.” If this becomes true, Microsoft will only further its lead given its investment in these two areas within the PowerBI solution and outside it. *The graphic was published by Gartner, Inc. as part of a larger research document and should be evaluated in the context of the entire document. The Gartner document is available upon request. Gartner does not endorse any vendor, product or service depicted in its research publications, and does not advise technology users to select only those vendors with the highest ratings. Gartner research publications consist of the opinions of Gartner’s research organization and should not be construed as statements of fact. Gartner disclaims all warranties, expressed or implied, with respect to this research, including any warranties of merchantability or fitness for a particular purpose. As a Microsoft Gold Partner for Data Platform and Analytics and a Cloud Platform partner, Simpson Associates have the necessary skills and experience to help. Find out more about our Microsoft BI Consultancy Services here or contact us to discuss your current requirements and book a demonstration.